Happy Mario Kart Day, Nintendo gamers! The usual download update details are out a little later than normal for North America and, unsurprisingly, the Mario Kart 8 DLC Pack 2 has a prominent place in the listing. It's not the only fresh arrival, though, we also have more Mario Kart of the retro variety, in addition to a Minecraft-esque release on 3DS, Mewtwo and more besides. Let's get to the details, shall we? Missed the European Download Update earlier in the week? Don't hurl your controller in anguish and frustration, the information you need is right here. Suspension Railroad Simulator (Joindots, $7.99) - If you've ever want to operate the Wuppertal Suspension Railroad, this is your opportunity. You drive and manage the quirky transportation service, or at least that's the idea; the issue is that it's rather dull and has visuals that'd fit nicely in the PS1 era. We were scathing of this in our Suspension Railroad Simulator review. Mario Kart DS (Nintendo, $9.99) - Joining its flashy HD successor in the headlines is this highly-regarded DS entry in the franchise, which brought us online play and a range of popular modes that are still desired to this day. It certainly has plenty of merits as a single player experience, which is useful as no multiplayer modes are supported in this Wii U release; you can read our assessment in our Wii U Virtual Console Mario Kart DS review. 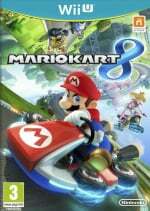 Mario Kart 8 DLC Pack 2 (Nintendo, $7.99 or included in a season pass for $11.99) - Featuring eight new tracks, three new characters (including boy and girl Villager variations) and four vehicles, this pack throws in cross-overs with Animal Crossing and F-Zero along with more all-new tracks and classic re-imaginings. A 200cc update is also available to all for free. You can check out our hands on impressions of the full DLC pack for more details. 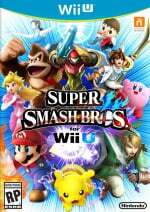 Super Smash Bros. for Wii U and Nintendo 3DS - Mewtwo (Nintendo, $3.99 for one version or $4.99 for both) - Available from 28th April. Cube Creator 3D (Big John Games, $4.99 until 6th May, then $7.99) - This aims to satisfy two camps in the world of Minecraft-style experiences - in Survival Mode you do the usual exploring, crafting and fighting to stay alive. Creation Mode will allow you to create your own worlds and share screens via Miiverse, with five environments to mess around with at launch and a promise of future updates. We'll get building and let you know what we think in a review. Shin Megami Tensei: Devil Survivor 2: Record Breaker: Apocalypse (Atlus) - Available from 28th April. That's the line-up for North America this week. Let us know what you plan to download in the poll and comments below. Got Mewtwo on the 15th and really enjoy using him, also might get Cube Creator 3D. Just Mario Kart 8 DLC Pack 2 for me. if I wanna play Mario Kart DS, I will just play on my DSi XL! What happened to Paper Mario? ok, I see that is next week. Nothing for me then....other than Mario Kart DLC... wow this is really a crappy week. If it wasn't for the DLC, it might be one of the worst. Just Mewtwo for me this week. Anyone know if the Mario Kart DLC 2 auto-downloads if you had pre-purchased? MK8 DLC for me. I gonna be loving this game for another month or two again. Paper Mario comes out next week. I checked on Wiki and that is cool because it will cost me $2. MK8 DLC's already downloaded to my Wii U waiting for me to enjoy it. I'm hoping CC3D will have a peaceful difficulty like Minecraft does where the only way you can die is through nature itself. If not, then I'll just have to deal with having enemies around. Bad week if you're not a Mario Kart fan (and I'm not). Metroid Zero Mission, Nintendo. GIVE. US. THE. OPTION. OF. BUYING. METROID. ZERO. MISSION. I am getting the DLC an perhaps MKDS. I still play that game anyway. Big Blue 200cc here I come! @Wuneye the update did for me and I was hoping the dlc. But I got to main menu it said new content available download now. But its not taking to long. When you start the game there is an update for 200c. When you get to the main menu it asks if you want to download the DLC. You beat me to it but I wasn't going stop! Good grief! Why would they make Mario Kart DS as the lone VC game?! Especially the same day as the Mario Kart 8 DLC? It's getting ridiculous. They've have to start giving us more than 1 game at a time. Especially if it is going to be Super Mario Advance, Super Mario Advance 2, Metroid Zero Mission.... games that are just upgrades of games most of us already have on VC. Oh well. I know it's futile to gripe about it. @rdrunner1178 Zero Mission is barely anything like the original Metroid though, but other than that, I agree with your sentiment. For my birthday today, I'll be getting 200cc and DLC Pack 2! Thank you @SetupDisk & @wicked636! @rdrunner1178 I feel the same way. I own Mario kart 7&8. Why would I even care about MK ds? I was hoping for zero mission or sonic advance. This whole one game a week has bothered me since I purchased my wiiu and 3ds. I'll bet it's a NOJ decision. Factor in NOA being horrible at selecting games to put the icing on the crap cake. There are multiple reasons why ill be taking a wait and see approach with nintendo's next console.This just happens to be one of those reasons. Is it just me or do the 3DS offerings get weaker by the week? Thanks for singalling the UK out Nintendo. Gogdammit. Thank goddness for the MK8 DLC. If you've got a Wii u this week, yr set. Otherwise I think I'll be checking out the Devil Survivor theme as I'm currently obsessed with the first one and don't currently have a Wii u (yet). @Aerolol I wish. I kind of finally decided to get Tensei IV so when that's 15 again, I'll be jumping into it. Ideally, however, id love a Star Fox 64 3D discount! They're probably waiting for the new Wii u game to let that one out. Got Mewtwo for free on the 15th & got the MK8 DLC pack 2 thanks to the bundle so nothing for me this week. @River3636 what wiki did you check or do you check for this information? Only the MK8 DLC this week as part of the pack. That's okay though, because I've been enjoying New Leaf the last little while and just purchased Story of Seasons. why are only 5% for mewtwo? I don't Fken understand nintendo, they announce n64/wii virtual console by giving us titles almost every week then stop? Literally the worst company that squanders their amazing back catalog of games. If Nintendo can't handle a new Wii/N64 Title ever week then they have failed uber hard. Nintendo should have many dedicated virtual console porting house pumping out as many virtual console titles as fast as they can, this would make people buy a Wii U, but obviously Nintendo has mission to degrade their position in the gaming industry as much as possible and make as littler money as possible. I could literally make nintendo as big and sucessful as it use to be but you need somone in charge with brains, and I'm sorry Iwata is not that man. I know many of you are nostalgic of Iwata as he's worked for Hal for many years and nintendo but in my opinion it's time for him to step down. The Business decisions under IWATA are flabbergasting to say the least. Please please please, I hope the stock holders pull together and demand Iwata to step down and they finally change the company, their pressure resulted in the Mobile announcement. Oh boy oh boy, I always wanted to drive a suspension train! @TerrapinJess here you go. For the most part it is reliable. Wii, Wii u and 3ds in all regions. @mrGREEK360 I used to defend Iwata considering his success with the DS&Wii. Those days are behind us now, and I've grown tired of his oddball decisions and inability to listen to the fans. The sooner he's removed the better. Why would they completely abandon the 3ds virtual console? Is it just the way the information was presented, or is there no Mewtwo DLC for 3DS Smash Bros yet? They have been slacking on 3ds virtual console lately. I'm ok because of MK8 DLC. I bet there will not be another one next week either because Paper Mario 64 comes out for WiiU. DLC for me. Still pretty busy with HW and I haven't picked up DK64. And again, Tetrobot is a steal at that price. Support a good, new IP, folks. They have been slacking on 3ds virtual console lately. For the past year other than a brief revival with the Donkey Kong Land trilogy. Waited until MK DLC was available to download and tried it out this morning. Was able to get 2 stars on the 200cc Mushroom Cup first pass without much trouble. Then I tried out the new Crossing and Bell cups on 150cc and had a hard time getting above bronze. I really like the new courses and the remakes like Baby Park. Baby Park can be hectic with a lot of items flying around, but I like the addition of the grassy area around the bends for if you have a mushroom. The Chomps on Cheese Land had me run off the edge to avoid them the first time around. Super Bell Subway has some nice long bends perfect for drifting (and getting hit by items), but I like the technical track with the train as an obstacle and the rocks on the inner bends that slow you down. Ribbon Road is fun if you time your jumps and avoid them when you need to drift, again another fairly open track for items to hit you though. Neo Bowser City is fun with many drifting areas, fortunately the water puddles were removed. Wild Woods and Animal Crossing are both fun without too much to them technically. Big Blue is a great course and fun as a start to finish single lap course. I kind of wish it was a little longer or had two laps, but it's still a blast. My biggest disappointment was that no additions have been made to the battle courses, they are still the original eight. I'm hoping one more DLC pack is announced that adds a few arenas more than anything. Still I wouldn't complain if we saw a few more courses and characters. Don't usually use my WU in the morning(I generally get to play later in the afternoon/evening), but I turned it on to work on my Mii, & the MK8 update installed. I also need to get MewTwo, since I didn't d/l (that) on the 15th. Still no Metroid Zero Mission for NA. I don't get it. MK8 DLC!! Finally, those idle little Animal Crossing faces in my character select screen can stop taunting me and I'll be able to use them! 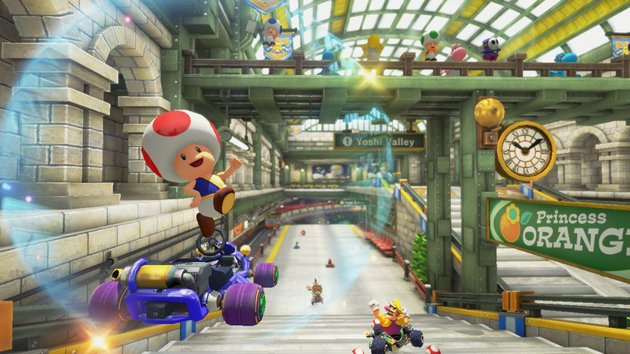 Technically I bought the Mario Kart 8 DLC months ago, but I'll finally be playing it later today. It's going to be all about Mario Kart for me. Nothing for me but that's okay, I'm knee deep in Story of Seasons and still have some games I bought from previous weeks that haven't been touched. I wonder what's Nintendo's excuse is for the hold up on Metroid: Zero Mission. @majinx07 I don't get it either. NA is supposedly the biggest Metroid fans yet we don't get an 11 year old GBA game when all other regions (AFAIK) have had it for a while now. Truly baffling. @majinx07 That's what get's to me more than anything else. They clearly don't listen at all. Is it really that difficult to go on FB,Twitter, or any of the other countless social media outlets to explain why they do what they do? Does Nintendo even investigate sites like NL or GI to get insight on what fans want or would like to see? I think NOA is just tired of complaints and let's it roll off their shoulders. I think the bigwigs at NOJ are so set in their ways, and detached from the rest of the world,and the current gaming industry, that they're not even aware that some fan's are really disappointed with the way Nintendo has been doing things. @Stu13 Mario Kart DS, Mario Kart 8 DLC, Super Smash Bros. DLC, and Cube Creator. @Mus1cLov3r Old roms that take very little resources to emulate is not too much to ask for.Psn&capcom got Megaman x4&x5 out a week apart shortly after its announcement.Nintendo seems to believe that drip feeding vc is a brilliant marketing strategy. @Wuneye No you must start up the game itself and once you open up the main menu the game will immediately identify if you've purchased it and a notice will be brought up asking you if you'd like to download now, of course for free) Took me a solid 15minutes to download it. I have pretty solid Internet connection. Am I the only one noticing or enduring this? Since I've downloaded the new Mario kart dlc, playing online is pretty damn laggy and I feel like I'm racing somewhere between 150-200cc vs 100-150cc type feel online Mario kart 8 had before this download. I'm stoked they've added 200cc but 100-150cc is where the magics at. I want things to go back to the way they were with the new dlc included. I pre-ordered the MK8 double pack last October, I'll also try to download MKDS sometime this month as well. I really don't like the pricing that Nintendo went for with Smash. Seems expensive compared to Mario Kart and Hyrule Warriors. @hcfwesker I'd much rather have Mario Kart Super Circuit than Metroid Zero Mission and that took 5 and a half months to come to EU regions. @Reznor52 The magic is at 200cc it what it always should have been online. @Grumblevolcano MK ds is a good game, but when Nintendo fans have MK 7&8 I see very little replay value with MKds.You beat all the cups in SC and ds and its over. Cube Creator 3D is literally Minecraft with much better looking animals. Nothing for me, and the last Mario Kart I bothered with was Wii. At least I have a seemingly endless backlog elsewhere... No complaints in that regard. I just downloaded the MK8 dlc. A lot of fun. I mean. I feel I got a respectable amount of new content and replay value for the price tag. I would still not say I'm 100% for dlc for every AAA game nintendo is gonna make. But I can say for sure this one was handled well. Not much of a week for me. @Superryanworld And? A lack of DLC doesn't make a week "Craptacular!" We don't buy a new system to play old games; most classics are available—one way or another—so why complain? @Mus1cLov3r True.If there was more retail games I wouldn't care, but there isn't. I bought the dlc, as I love MK8. I play it all the time. Asking for vc games is not a big deal. I'm not asking for a AAA full budget game here, though nintendo could use a few more of those. Im asking for more than one vc game a week. seems likes simple request to me. Unless, it takes a massive amount of time,resources, and money I don't see how it's such a major request. If things look the way they do now on nintendo's next system, I won't be around to complain anymore. If Microsoft or Sony ignored their fans like nintendo does, I'd drop my support for them as well. @Superryanworld There are plenty of AAA games coming. Asking for VC games is a pretty big deal; if I remember correctly, they have to convert the screen-size and stuff, and they have to re-assign the controls to fit the WiiU/3DS' controls. But I'm not experienced in this stuff—so don't take my word for it. Nintendo can't—nor can Microsoft or Sony, for that matter—listen to each and every individual request. Besides, Nintendo doesn't ignore their fans; if that were the case, Lucas wouldn't be returning to Smash, and the Smash ballot wouldn't exist. Besides the DLC, lame week. When are we going to see the VC return to the 3DS again??? @Mus1cLov3r You make many fair points. No company can take a few individuals complaints as if their business depended on it. I was under the impression that many where unhappy with the state virtual console is in, and not just me. I do believe that nintendo doesn't take consumer/fan feedback as Microsoft and Sony do. look at the launch of the PS3 and Xbox one. Both systems where in major trouble in the beginning due to arrogance and assuming they knew what gamers wanted more than gamers themselves. They listened and turned their troubled situation around. I want to continue supporting nintendo,so I'll see what the next systems have to offer and improve on. New courses are a lot of fun. Better designs than I anticipated. Outside of the Mario Kart and Smash Bros. DLC, (and perhaps Mario Kart DS, for those who'd want it) this is a pretty weak week. @Wuneye It did for me! Dry bowser is sliding all over the place though. Guess I'll just go back to Metal Peach or Link. @Superryanworld thanks!! I didn't even have to try too hard! That list was off the top of my head while watching the Mets game lol! !